The Internet Of Things: Game On! 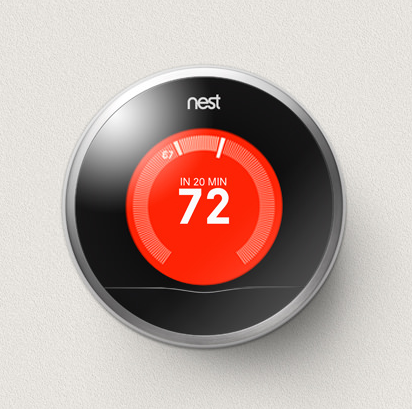 Big news in the tech world this morning, as it has emerged that Google have paid a cool $3.2bn for Nest, a company best known for making smart thermostats that can be controlled over the web. Not only is this big news – when someone as big as Google pays $3.2bn, you know they’re serious – but it also fires the starting gun on the real Internet of Things. “Things” have been doing the internet for some time now – there’s all sorts of unusual wifi-powered products. The likes of Belkin’s WeMo range – wifi-controlled plugs and bulbs that can be controlled through smartphone apps, to Nest’s rival smart thermostat from Tado, who have been carving out their space in the market. Tado have just announced they’ll be making a similar system for air conditioning in warm countries – and Nest have also branched out into smoke alarms. What’s big about the Nest acquisition is that it is the first time one of the titans of the tech industry has got directly involved. Now Google have a direct stake on the success of smart devices – beyond simply supporting their apps on their phones. Now the game is on, and it is inevitable that the likes of Apple, Microsoft and Samsung will be getting out their chequebooks to respond. Apple already sell Phillips Hue bulbs, which can be controlled via app in their stores (you can change the colour of the bulb at the touch of a button!). For Google, the move makes a lot of sense. Not only are Things going to become the next place major growth can take place (mobile phones are saturated, and market shares are trickier to shift around, lest anything as game-changing as the iPhone appear again), but a smart thermostat helps satiate their endless appetite for data. Google already track your location, know what you’re searching for and can read your emails – now they’ll know if you’re at home by tracking room temperature. Consider how Nest also make smart smoke alarms that can be used as presence detectors – Google will even know what room you’re in. In the kitchen? Your phone could recommend some recipes. In the bedroom at 11pm? Your phone is set to “do not disturb”, your alarm is automatically set and your smart lights are dimmed. This is the automated and slightly creepy future we face. Smart devices are genuinely useful though. Having used a Tado myself for the past few months, I can confirm that nothing beats cranking up the temperature before you get home, so it’ll be warm when you get there, so the utility to users of being able to use their Android phone to control their Nest will be super useful. Plugging temperature into Google also creates many different interesting possibilities. From the potentially useful (auto-adjust the temperature based on whoever is in the room’s personal preference) to the frivolous. Imagine if the Siberia mission on the next Call of Duty would subtly decrease the temperature in your living room, so you get a shiver go through you as you trek through the Russian forests. It is inevitable that this is the start of the arms race – and that all of the manufacturers will now be trying to figure out what appliances they can stick wifi into next. My only hope is that the industry do the sane thing and work out either some standards, or agrees to be cross-compatible. If I make the switch from iPhone to Android, I don’t want to have to replace my thermostat, washing machine and fridge too! It’ll be interesting to see what happens next. The Internet of Things is On.